How are things? I decided to get a protective style done this week (details to come). 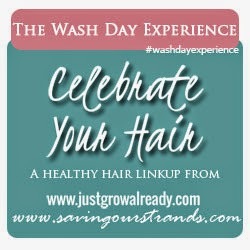 So to prepare for it, I wanted to achieve a few things with this wash day:  clean hair  strong hair  moist hair and  stretched new growth. My wash day was pretty simple. Since I started late, I didn’t want to spend an eternity doing my hair. I started around 6 p.m. and finished around 10 p.m.
(1) Prepoo with Vatika oil. Detangled after applying oil and kept under cling film for 30 minutes. When I detangled, I saw very little shed hair. This may be because it was less than 7 days since my last wash day. I’m still counting it as a win. (2) Washed twice with ORS Neutralizing shampoo. I used this to make sure my hair was clean. (3) Towel dried and applied Aphogee Keratin 2 Minute Reconstructor. I kept it on for 2 minutes without covering my hair. My hair felt really soft and strong after rinsing this out. (4) Towel dried and applied a mix of Aussie Moist, Creme of Nature Argan Oil Intensive Conditioning Treatment, Keracare Humecto, olive oil and castor oil. I covered my hair with a cling film and kept it on for 45 minutes. (5) Rinsed out the conditioner mix thoroughly and then I did an ACV rinse. (7) Detangled in the same 6 sections. Then I did a tension blow dry in sections using medium heat and speed. Then I moisturize with Cantu Creamy Hair Lotion and sealed with my oil mix (grape seed, cocount, and olive oils). My hair was big and fluffy. I struggled to put it in a bun. My hair was pretty moisturized the next day and my new growth was pretty stretched. 🙂 While blow drying, I became really aware that I need a major trim. I need to take off 2 to 3 inches (~ 5 – 8 cm). 😥 It is all for the benefit of my hair. I don’t want to do it myself because I messed up my hair the last time I cut it. Also, the last trim I got wasn’t enough. I still saw some split ends after that trim. I will probably trim once I take out my protective style. I need to devise a good plan to minimize my split ends. Any suggestions?